I’m in the mood for Mexican tonight. Well, I am in the mood for Mexican every night, but tonight I am doing something about the yen. Mexican food is so rich and delicious. I love cooking it because I can adjust the spice exactly the way I want it, instead of letting a cook in my local Mexican restaurant decide how hot the dish should be (which, from experience is usually too hot and too salty). I love spice, just not blow your taste buds out spice and I cannot abide food that is too salty! A lot of the flavor (and spice) comes from the taco sauce on the top of the enchiladas, so be sure to use a taco sauce that has the heat you like. One of the best parts of this recipe is that it combines chicken thighs which have a ton of flavor, so the dish has a great richness to it. I use boneless, skinless thighs to keep down the fat content. ** Cooking Tip: **I used burrito shells. No matter how hard I try, I can never get the filling inside a normal sized tortilla, so I take burrito shells and trim them to the width I want but leave the length. They roll beautifully and fit perfectly into my pan. Then I use the left overs for making home made tortilla chips! Add some refried beans and a side of rice and you will be wondering why you ever go out for Mexican food. 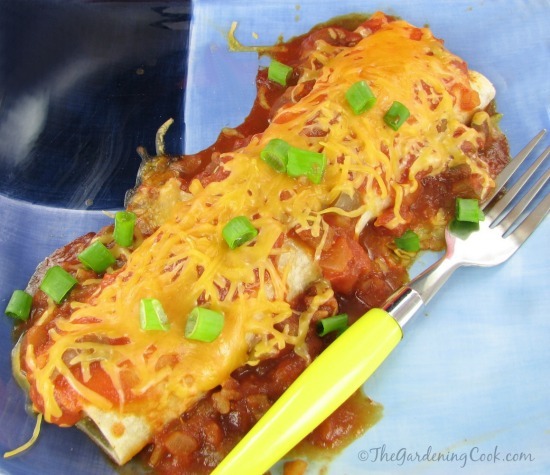 This dish is so easy to do and is on the table in about 45 minutes or so. I make mine in the morning, or the night before, and then just pop them in the oven at dinner time for about 20 minutes to make it easy in the evening. If you love Mexican food but don’t think you will be successful cooking it at home, try this great book from our affiliate Amazon.com. It is called Truly Mexican: Essential Recipes and Techniques for Authentic Mexican Cooking. (affiliate link). The book is an introduction to Mexican cooking and covers the main ingredients as well as how they’re best prepared—from toasting tortillas to roasting tomatoes. You will be cooking like a trained Mexican chef in no time with this book’s help! 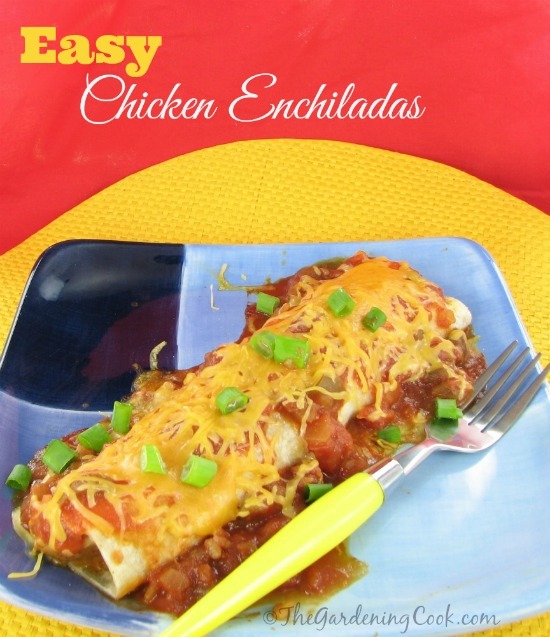 Treat your family to some zesty chicken enchiladas. This recipe will rival one from your favorite Mexican restaurant. In a medium, non-stick skillet over medium heat, cook the chicken until no longer pink and the juices run clear. Drain the excess fat. Cut up the chicken and return it to the skillet. Add the onion, sour cream, Cheddar cheese, parsley, oregano and ground black pepper. Heat until the cheese melts and everything is well combined. Stir in the salt, tomato sauce, water, chili powder, red pepper flakes, green pepper and garlic. Roll even amounts of the mixture in the tortillas. 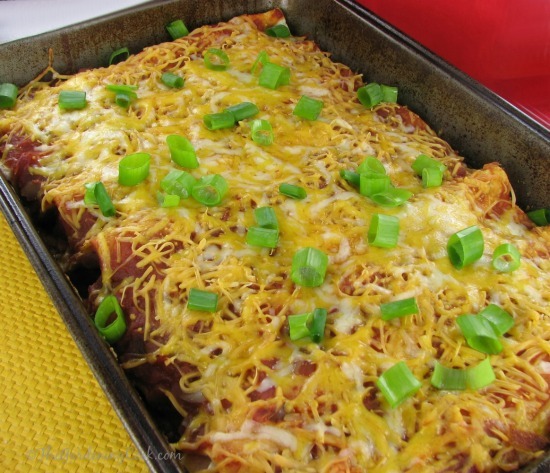 Arrange in a 9x13 inch baking dish and Cover with the taco sauce and 3/4 cup Cheddar cheese. Bake uncovered in the preheated for oven 20 minutes until the cheesy is lightly browned and bubbly. Cool 10 minutes before serving. Garnish with chopped spring onions. Enjoy!